Each child, in a family unit, takes on a role within that unit. My older sister was the Artist, I was the Singer. She went on to work in her field for many years and is very good at what she does. I still sing, but essentially do it on paper, mostly when writing poetry. In the intricacies of family dynamics, it is difficult when two siblings share a common interest. It makes for comparisons, jealousies, resentment and so forth. Although I liked, enjoyed, and even played with Art, I lacked the drive and fine-line skill and ability that my sister achieved. Those were, for me, channeled into writing. 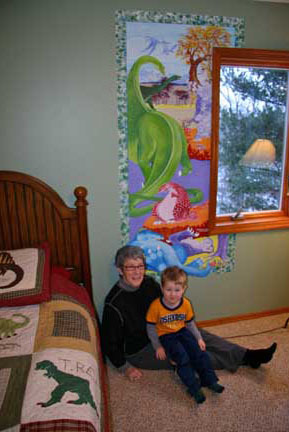 She recently did a mural for her grandson’s bedroom that I simply love. It is whimsical, colorful, filled with interesting detail, and so really connected to him all at the same time. Who wouldn’t love a grandma that can do that? I, on the other hand, have invented stories for my grandchildren, written poems to and about them and the things they’ve said, and actually wrote and read a poem at my daughter’s wedding at her request. Although my sister and I share a few common interests: she loves to read and discuss what she reads, I love to doodle and sketch for relaxation, we are, and have always been, very different people. This space is to allow you to know me a bit better. So it must include some of the things I do and love. And one of those things is color and movement. I have included a few images and intend to maybe include a few more as time passes. These images are a hobby I occasionally find pleasure in doing. The first two were generated on a simple computer paint program. The third was a fresh pen and ink sketch that I spilled water on, and luckily had a paint brush along to play with. Although most of my ‘art’ is accidental, I wanted to show this other side of me. Another piece of my puzzle. All Art, in whatever form it takes, is self-expression. We all need several outlets for that endeavor. This is one of mine, but my real Art has always been in the arena of words, language, metaphor, etc. Everyone needs to take a break from the mainstream on occasion. This is one of mine. Notice as of May, 2009: To anyone who might be interested, I have posted a Mandala gallery at my poetry site: http://soulsmusic.wordpress.com/ These are images created by Marc Bove and colored by me. His site is posted there as well.